The holidays provide a wonderful time for small businesses to increase sales, customer loyalty and their overall reputation. But with so much hustle and bustle, planning and preparing can be difficult. In order to help our small business entrepreneur friends, we've put together a short holiday survival guide – a collection of tips that will help you survive and even thrive during this holiday season. November 28th - Black Friday: The Friday after Thanksgiving, Black Friday is noted as the first day of traditional Christmas shopping and is earmarked by many significantly discounted offers online and at brick and mortar retailers. November 30th - Cyber Sunday: For those retailers trying to get a jump on Cyber Monday, Cyber Sunday is a new holiday that crept in over the last few years to allow retailers additional opportunities to increase sales and offer promotional discounts, particularly in the space of electronics, technology, digital goods, etc. December 1st - Cyber Monday: Debuting in 2005, and always the Monday after Thanksgiving, Cyber Monday was created by marketing companies to persuade people to shop online. It has quickly become one of the biggest online shopping days of the year. December 2nd - Giving Tuesday: Keeping with the spirit of the Holidays, Giving Tuesday (#GivingTuesday) is a global day, dedicated to giving back. It’s a day that charities, families and businesses around the world come together for the sole purpose of celebrating generosity and to encourage giving of donations and service to others. December 8th - Green Monday: Coined by eBay to describe its best sales day in December, Green Monday is an online retail industry term and usually falls on the second Monday of December. December 18th - Free Shipping Day: Started in 2008 by the founders of FreeShipping.org, this promotional holiday was developed as a way for online consumers to shop at large and small online merchants and receive free shipping on items, with a guaranteed delivery on or before Christmas Eve. December 20th - Super Saturday: Super Saturday is the last Saturday before Christmas and a major day of revenue for American retailers. For many, it marks the end of the holiday shopping season. December 22nd - Last Sleigh Day: Last Sleigh Day might just be the new end of the holiday season shopping season. It is typically the last day that online consumers can place orders for expedited shipping and receive them by Christmas Eve. The website, Last Sleigh Days, lists top online retailers and their last minute shipping options and deadlines. 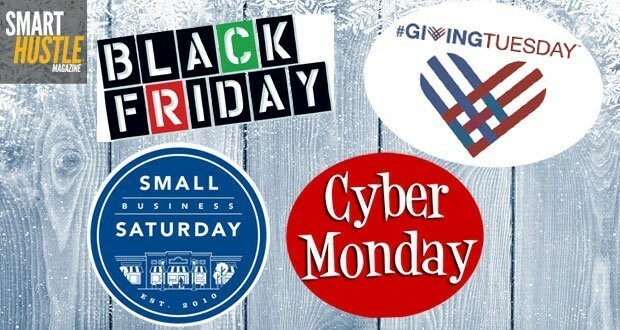 Your Must-Know #MarketingHolidays: From #BlackFriday and #GivingTuesday to #LastSleighDay! We all know that the holidays can be a very stressful time of the year, especially for small businesses scrambling to end on a profitable note. But, despite the hustle and bustle, it’s important to remember the spirit of the season and treat customers, employees, vendors and others with kindness, consideration and respect. Take time to note if your employees, vendors and customers practice different religions or holidays, and be respectful and inclusive in your holiday planning. Send holiday greeting cards to your most important contacts. While it may seem like a thing of the past, or an expense in time and money you cannot afford, the reality is that it is a perfect opportunity for you to show exactly how much the recipient means to you and your business – so take advantage! There are several online services that automate "hand-written" cards for those just too busy to physically write and send individual cards manually. I personally use SendOutCards for this purpose. Do something special for your employees. It doesn't have to be a full blown holiday party or an expensive gift, just show them how much you care and appreciate all they do for you, all year long. After all, without them, you wouldn't be able to do what you do! Do something special for your customers – they are the lifeblood of your business. Again, it doesn’t need to be anything that is going to put a big dent in your budget, but paying special attention to your customers, giving something of value will go a long way in retaining their loyalty and long-term patronage. For all small businesses, getting involved in your local community, or a cause that is close to your heart, is not only altruistic but can reflect positively on your business. There are a number of ways you can get involved and programs you can run – from donating a percentage of a sales amount, allowing customers to buy certain items for donation at a discount, to serving as a collection point for items such as canned goods or toys that are then donated to local charities. While the primary purpose of getting involved in a good cause and giving back shouldn't be to market your business, it is entirely acceptable to highlight your charitable programs in your marketing (and social media efforts) to let your customers know about them, helping boost the success of such efforts to do good through maximum participation. Have additional ideas on how to celebrate and show appreciation for your employees, customers and partners during the holidays? Additional "marketing holidays" we didn't mention? Great causes or charities that your business supports in out of the box ways? We'd love to hear from you in our comments section.